A crack unit of pimps was assembled on the south coast to haul up for the weekend until our creation was finished. Now all was needed was an appropriate subject. A touch of class seemed appropriate so what better than the gooey overpriced (£1.25 for four) loveliness of the Lindt Lindor. 2. Grease the two bowls with butter. Break up four milk bars into a pan melt over a low heat. 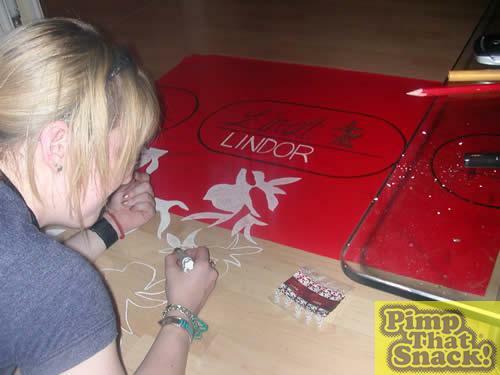 Pour into the bowl to make the base of the Lindor. Repeat for bowl two. Put in freezer for quick (1 ½ hours) chilling. 3. 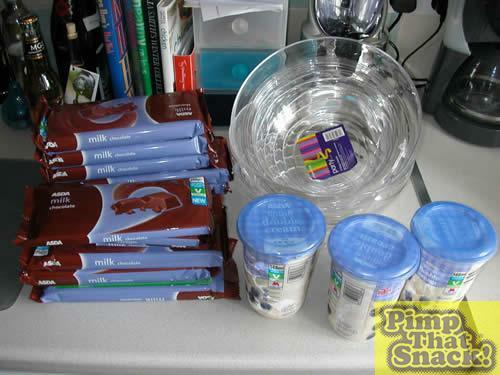 Next melt sickeningly large amounts of choc for the sides. 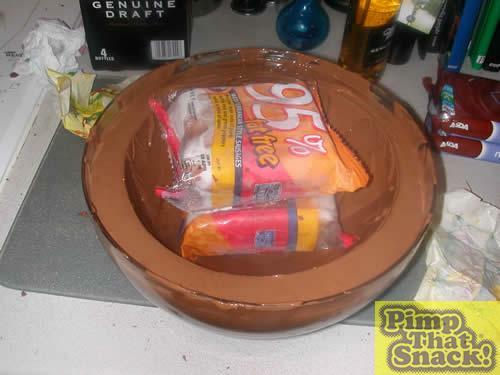 Pour around a second smaller bowl. Then we weighted this down with 95% Fat free sausages, because a pimps got to stay lean! Two complete halves go back in the freezer to set. 4. Meanwhile. The Art director scales up the wrapper to mammoth size. Those with less artistic gifts did some colouring in. 5. Now for the filling. Hollowing out Lindors was deemed to be too expensive; chocolate spread was too low quality so a rich, creamy ganache (not to be confused with the Hindu god Ganesha) was settled on as most suitable. 6. We heated up one of the tubs of cream in a pan until nearly boiling, then poured it over 400g of broken up dark choc and stirred till melted and mixed. 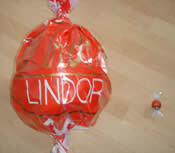 This is enough for one half of the Lindor. We then threw this in the freezer to speed up the setting process. 7. We now removed the shells and removed the inner and outer bowls with some gentle persuasion, a hammer and pliers. Excess butter was buffed off and they were filled with ganache. 8. 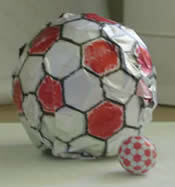 More melted choc was used as a sweet glue to put the two halves together. With one quick flip the beast was whole. An hour in the fridge and it was ready to be wrapped.